We decided pretty much randomly on western Massachusetts. I knew the Berkshires were a place that I wanted to visit at some point. In a web search, Monument Mountain in Great Barrington came up as one of the nicest hikes in the area. So, we picked Monument Mountain. There is perhaps nothing unique about picking Monument Mountain, it’s in the same state I live in, and apparently 20,000 people visit it a year. I decided on a hotel in the same town, Great Barrington, based purely on price. It was economical at $110 a night. My wife thought we should try a different hotel, but I stuck to this one, and we finally settled on it after considering other places. The hotel ended up being centrally located in Great Barrington and from it we could easily walk around the town center. We visited some stores and got a local brochure at a freestanding kiosk near Pleasant Street. One brochure described two paths along the nearby Housatonic River. 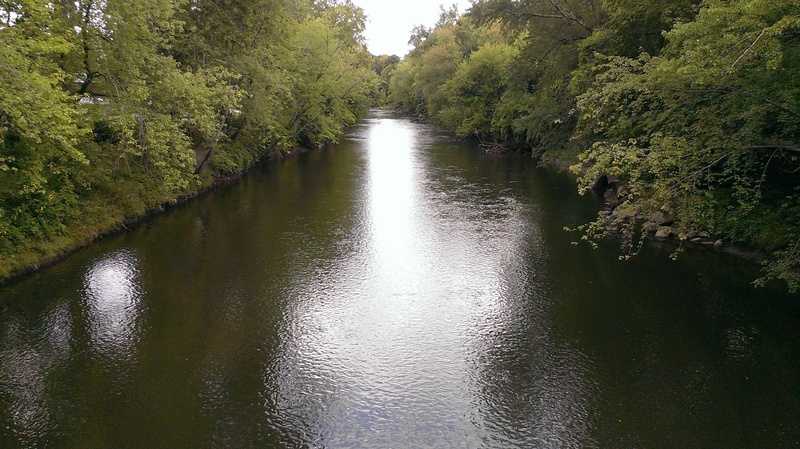 The Housatonic River in Great Barrington, MA. W.E.B. Du Bois’ birth place is near the left bank. We saw that one of these two paths was at the end of Pleasant Street, so we headed there. It was on this walk that I learned from posted information that not only was this river very important to Du Bois but to my astonishment, the path led past Du Bois’ birthplace. 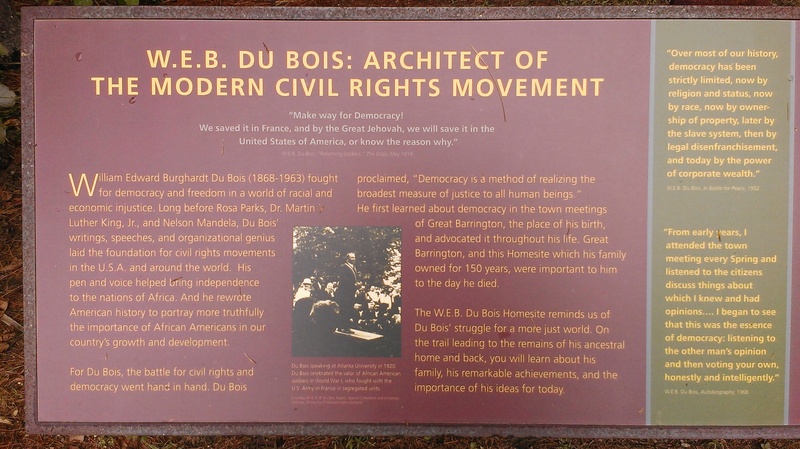 I didn’t even know that Du Bois was from Massachusetts until that moment — and now was standing in a memorial garden dedicated to him on the edge of the river, his birth place a few hundred feet away. Information at W.E.B. Du Bois’ boyhood homesite. The walk leads you through the life of Du Bois bringing you to the ground where the house of his youth once stood. He grew to become a gifted student eventually earning a PhD from Harvard. Du Bois saw co-ops as an economic solution and source of freedom for African Americans. This fact was brought to light in Collective Courage by Jessica Gordon Nembhard, which I’ll review next post.